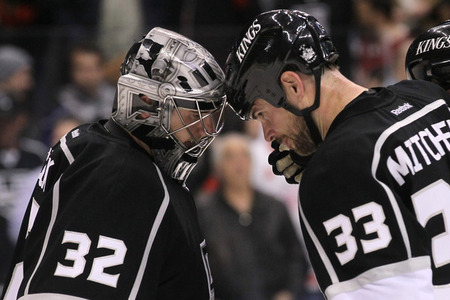 Last night, the Los Angeles Kings jumped out to a 1-0 series lead over the Phoenix Coyotes. In doing so, the Kings improved to an astonishing 6-0 on the road, and 9-1 overall during the 2012 Stanley Cup Playoffs. The Kings have had a stellar defense all season long and now seem to be clicking on the offensive side of the puck. The offensive wheels have started turning for the Kings and the players starting that offense are those that try to keep other teams from generating it. The Kings' defense have been moving the puck with precision and confidence through the playoffs, with Drew Doughty possibly doing it the best. The Kings defense rarely panics deep in their own zone, and often take a step out from behind their net in order to make that first break out pass. This often draws a man or two to the puck and makes that outlet pass available. The Kings often make this pass on the first try with the accuracy needed to get the puck out of their zone. These tape-to-tape passes allow the Kings to create opportunities with their transition game and keep the time in their defensive zone to a minimum. Dustin Brown's game winning goal against the Coyotes was the result of a beautiful stretch pass from Slava Voynov, check that out in the video below. Don't be shocked if Doughty, Voynov or Alex Martinez, the Kings' other young d-man, make a move or two and carry the play into the offensive zone themselves either. The Kings defense can be seen in two categories, the younger, skilled and mobile group of Doughty, Voynov and Martinez, and the older, stay at home, defensively sound group of Willie Mitchell, Rob Scuderi and Matt Greene. If the Kings continue to have such great success with breaking out the puck, their offense will likely follow. If that fails at least they have the defense to bail their asses out.